Two events inspired me to put digital pen to paper this week. The first, was the launch of our new training course, ‘The Internet of Things’. The aim of this session focuses on digital transformation with smart, connected technology. When researching explanations for ‘Internet of Things’. the simplest seems to be: “the impact of low cost computing in order to create a connected world”. Examples of this can be far-reaching and literally save lives. For example, the Smart contact lens that monitors sugar levels for diabetes sufferers, and sends an alert to a connected device if glucose levels dip or spike. The healthcare sector specifically could be revolutionised with wearables which can diagnose and prescribe remotely, saving healthcare services time and money and ultimately reaping better results for the consumer. In the retail world too, technologies, or IoT will provide competitive advantages as inventory and out-of-stocks can be optimised for better sales returns. I recall going to an event with Microsoft approximately 10 years ago, where there were fridges that told you when products within it were running low and needed re-ordering. Where bread boards doubled up as infra-red keyboards, and being totally astounded by the possibilities of technology. Now, with connected devices in most homes in the UK, this seems like child’s play! Is technology a barrier to creativity? The second event, and I will draw upon the connection between the two shortly, was the Cannes Lions media festival, taking place this week. Sadly I am not attending, despite attempts to persuade our finance team that this would be most worthwhile. However, the great and good of advertising and media are gathered to celebrate the best, and most effective work across the globe. There has been much written about Cannes this week, but there are two stand-out articles for me. The first is from Dominic Mills, who is forthright about the disconnect between original, brilliant thinking and advertising which is designed to win awards. Sometimes, the latter can be created to seduce via technology, as opposed to solid thinking with the consumer at the heart of the strategy. There is also a brilliant piece by the head of brand marketing at MillerCoors, Gannon Jones, who refreshingly says that ‘ technology can act as a barrier to creativity, and will never replace great ideas’. A brilliant example of this in my opinion (and a Cannes winner this week), is the BA Outdoor digital work from OgilvyOne, and in conjunction with Ocean Outdoor. 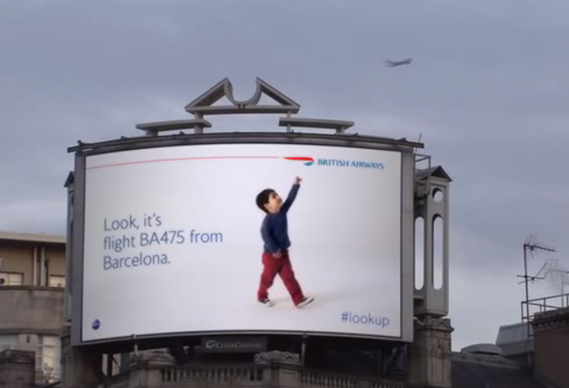 This campaign ran digital posters in London, positioned under the flight path to Heathrow, which featured children reacting in real-time to flights going past overhead. Whenever a BA flight goes past the poster, a child gets up and points to the plane overhead – then the specific flight info appears them to him on the board. Clever, cute, and a brilliant fusion of technology and brand. The other piece of work, which is in my all-time Hall of Fame (and also featuring Ocean Outdoor) is the digital campaign for Women’s Aid. This was an interactive campaign, which was designed to raise awareness of the domestic violence charity, and illustrate how everyone can make a difference in the fight against domestic violence. Running to promote International Women’s Day earlier this year, the creative used unique facial recognition technology, which allowed the poster to recognise when passers-by paid attention and looked at it. The billboard depicted a victim of domestic violence, but as more people looked at the poster, the woman’s bruises slowly heal and dissipate. The aim of the message is clear – if you look away from domestic violence, nothing will change. I have yet to see a piece of work which so brilliantly fuses technology and brand insight to bring to life the issue in a more powerful way. Congrats all round to the team involved. So for me, it’s the brand work that wins, when it is carefully and cleverly considered, alongside technology which helps to dramatise and amplify the message in the most innovative way. And who knows, next year I may even get to walk down the Croisette for Cannes week!